Today, people think of chocolate as a delicious dessert. However, in Ancient Mesoamerica, cacao beans had a much greater societal significance. According to Professor Martin, cacao influenced numerous facets of society: religion, culture, art, politics, and the economy. Cacao’s impact on the economy is the primary focus in this blog post. For example, cacao allowed the wealthy to distinguish themselves from the poor. According to anthropologists, the consumption of chocolate “was confined to the Aztec elite – to the royal house, to the lords and nobility, to the long-distance merchants, and to the warriors” (Coe 95). It was commonly served at the end of meal along with tobacco. The ”frothy, stimulating drink” was a common feature at many elite Mesoamerican events such as weddings (Baron 211-212). They also classified it as the “food of the gods”. In addition, the warriors consumed cacao as an energy stimulant before battle to make them feel invincible (Martin 52). Cacao quickly took over alcohol’s spot as the “new marker of social status” (Baron 211). Aztec ruler Motechuzoma II possessed 960,000,000 cacao beans (Martin 72). This incredibly large number of beans cemented his spot as the wealthiest individual in Aztec society. The high value of cacao as a beverage is directly correlated to the value of cacao beans as currency in both the Mayan and Aztec societies. Most anthropologists acknowledge that cacao beans were one of the most prominent forms of currency in the Aztec World. However, Mayans commonly used cacao in transactions as well. Cacao became a prominent form of currency in the Mayan southern lowlands during the Postclassic period (900-1521 CE) (Baron 211). The flavorful physical properties of cacao certainly increased their value as a commodity. By drying and roasting cacao beans, one can preserve them for months before they are ground up into chocolate. The beans themselves were valued based on their freshness and plumpness. Color was also an important indicator for cacao beans. The ashy colored beans were valued higher than the red colored beans because the ashy colored signified full fermentation. Shriveled, red colored beans were the lowest valued beans. 16th century naturalist Francisco Hernandez also points out that there are four categories of cacao beans: “cuauhcacahuatl (tree cacao), mecacahuatl (string/rope cacao), xochicahuatl (flower cacao), and tlalcahuatl (earth cacao/humble cacao). (Baron 212). The smallest beans (the last few on the list) were most commonly consumed as a beverage and the rest were typically used as currency. Through 7th century murals at Calakmul, archaeologists discovered that cacao beans were commonly exchanged in marketplaces both small and large. The mural depicts individuals from different social classes buying, selling, and exchanging certain goods (maize, tobacco, jewelry, cloth, etc.) One particular image depicts a woman exchanging a bowl of chocolate for a man’s tamale dough. This archaeological excavation reveal the integral role that cacao played in the marketplace as both currency and a tradable good. In addition to Mayan society, the Aztec Empire had their own form of currency that relied heavily on cacao. From 1430-1531, Aztecs traded cacao beans and offered them as tribute (tax) to Tenochtitlan (Weatherford 19). Aztecs and Mayan rulers received taxes in the forms of cacao sacs. These sacs included the numerical glyph “pik” which represents 8,000 cacao beans (a typical unit of measurement for cacao tributes) (Baron 214). This unit of measurement comes from the Aztec Xiquipilli. A cacao bean’s high market value is also attributed to its common use as a tribute. This example again shows how cacao beans differentiate the wealthy from the poor. In addition to tributes, cacao beans were most frequently involved in a barter system (Weatherford 19). Traders typically used cacao to even out transactions. While cacao beans could be exchanged directly for a particular good (1 cacao bean = 5 green peppers), they were also added on at the end of trades to even out the transaction. For example, if an “Aztec wanted to exchange an iguana for a load of firewood … and if the good did not have precisely the same value, the traders used cacao to even it out” (Weatherford 19). However, cacao beans provide some of the first examples of counterfeiting practices. Individuals would take the shells of cacao beans and fill them with mud to deceive their exchange partners. Despite this disadvantage of an edible currency, Cacao is unique because it is a commodity that one can consume as well as exchange. 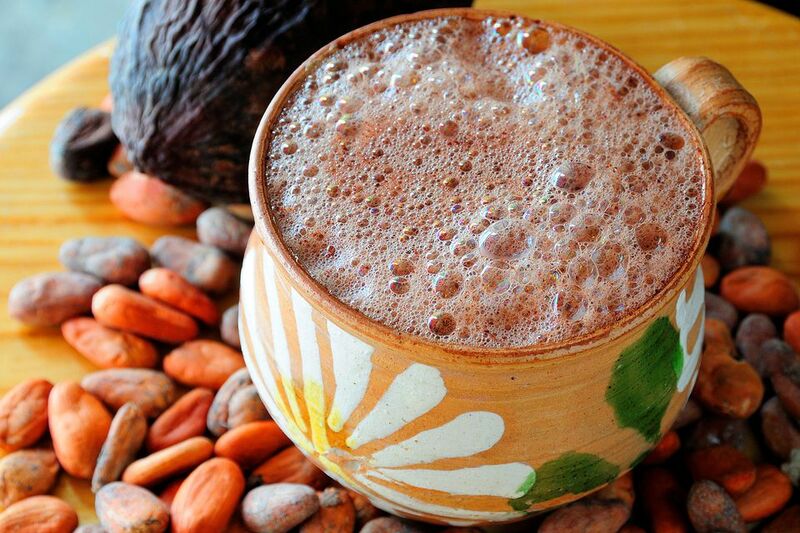 The cacao beans can be turned into a frothy beverage or traded for an avocado. Paper money and coins do not have this advantage. This differentiation truly makes cacao beans a unique form of currency. In order to truly understand cacao’s value in the marketplace, it is necessary to analyze some typical transactions involving cacao beans in the Aztec Empire. Professor Martin’s lecture from February 6th perfectly outlines some of the most common exchanges. According to the Nahuatl document from 1545: a male turkey is worth 200 cacao beans, a small rabbit is worth 30, one turkey egg is worth 3 cacao beans, an avocado is worth 3 cacao beans, one large tomato is worth one cacao bean, a larval salamander (an Aztec delicacy) is worth 4 cacao beans, and fish wrapped in maize is worth 3 cacao beans (Martin 73). These are all examples of typical marketplace transactions that utilized cacao as currency. Even other non-Mesoamerican societies at the time used cacao beans in transactions. For instance. The Nicarao of Nicaragua in the 16th century exchanged 100 cacao beans for a slave and 8 to 10 cacao beans for a prostitute (Coe 58-59). While traders more frequently used cacao in exchange for other foods, textiles, or accessories; it is important to acknowledge that human services were an integral component of the 1500s marketplace. Cacao was a common commodity in the purchase of those services. Cacao beans played an integral role in both the Aztec and Mayan societies. It was not only considered an elite beverage; it was a prominent form of currency in the Mesoamerican marketplace. With cacao beans, one could purchase a turkey egg, pay their taxes, or buy a slave. People rarely think of food as a form of currency in the modern era. However, in Mesoamerica, food, such as cacao, carried a much greater societal importance. Baron, Joanne P. “Making money in Mesoamerica: Currency production and procurement in the Classic Maya financial system”. Economic Anthropology: Society for Economic Anthropology. May 10, 2018. Coe, Sophie D. & Michael D. Coe. The True History of Chocolate. Thames and Hudson Ltd; 4thed. 2013. Weatherford, Jack. The History of Money. Crown Business; Reprint edition. March 10, 1998. Charles River Editors. The Last Emperor of the Aztecs: The Life and Legacy of Montezuma. CreateSpace Independent Publishing Platform. August 23, 2013. Mursell, Ian. “Beanz Meanz Money”. Maya at Mexicolore. 1994. Cornell University: Albert R. Mann Library. “When Money Grew on Trees”. Chocolate: Food of the Gods. 2007.